Tire giant Michelin manufactures tires for just about anything: from strip-mining Earthmovers to pricey, thumbnail-width buns for your bicycle. Thankfully for us, motorcycle rubber is of particular interest and expertise to the French company. Michelin’s newest high-performance tire, the Power One, slots in perfectly alongside a growing line of premium race-derived motorcycle tires. The Power One utilizes dual-compound technology, a term now somewhat commonplace in performance and sporting tires. Michelin lays claim to utilizing multiple compounds as early as 1994, but the most recent tire from Michelin to receive dual-compounds billed as a key feature was the Pilot Power 2CT. For the uninitiated, a dual-compound is just what it sounds: one level of rubber hardness/grip in the center, with a softer, grippier compound on the sides. Typically the front often has a nearly equal, if not greater, ratio of soft compound on the tire’s shoulders when compared to the harder center compound. It’s not unusual to see a rear tire contain more of the harder compound when compared to the front tire’s dual-compound ratios. This is usually due to the simple fact that the rear tire has more available real estate, and it’s the bun that gets all of the abuse from the engine, so a greater area of harder, longer-wearing compound is necessary to keep the wear rates as equal as possible. In addition to 2CT tech, the Power One employs what Michelin calls MRSE (Michelin Racing Synthetic Elastomers) compounds combined with HTSC (High Tech Synthetic Compound) resins. The general idea behind this tire jargon is that Michelin’s particular cocktail of compounds is aimed at providing fast warm-up times while offering good grip characteristics. Finally, we get one more acronym: NST (Near Slick Technology). The minimal tread grooves cover only 5% of the tire’s surface, maximizing rubber contact with the road. Michelin claims the resulting traction helps facilitate lean angles approaching 60 degrees. Upon first seeing the Power One as fitted to the quartette of stars in the racetrack leg of our 2009 Supersport Shootout, we couldn’t help but agree that they were nearly slick. The first three sessions of our late February trackday at the Streets of Willow saw us sipping cocoa, taking cover from an early morning rainstorm that left puddles in the parking lot and a greasy looking track surface. We weren’t terribly eager to see just how “near slick” the Power One was, but eventually the rain gave way to mostly cloudy conditions. The benefit of tire warmers undoubtedly aided our willingness to “tip it in” during the first few laps of our early sessions. However, as the day wore on, skies cleared and temps rose to at least average for that time of year in the Mojave high desert. Tire warmers became luxuries rather than necessities at that point; it was all systems go and throttle on by mid-afternoon. Guest tester, author and one-time Isle of Man TT finisher, Mark Gardiner, was immediately impressed with the Power One’s quick warm up. 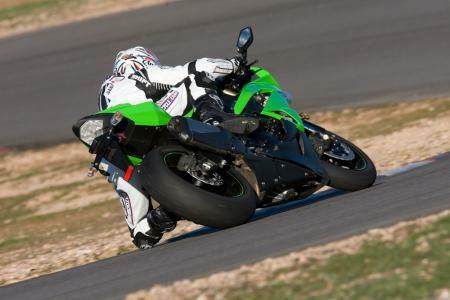 “Early in the day, when I took out the Honda CBR600RR for the first time, I was struck by the tires' ability to develop full grip on cold asphalt that was still a little damp in spots. The grip was great, and it got great quickly – as if the tires hardly needed to get up to temperature.” A notable response from someone who’s painfully familiar with racing in the rain; the TT is notorious for getting peed on. Our now-regular-at-MO-guest tester, and general good guy, Kaming Ko, headed out sooner in the day than the rest of us. His report after circulating in wet conditions supported Mark’s initial assessment. Indeed a good point, and something we need to address in light of the tires’ seeming propensity to show early wear is the fact that the version of the Power One we sampled was a road/track model. Other, race-spec versions of the Power are specifically aimed at track use. Michelin U.S. rep Dan Wildhirt explains that “trackside race-tire distributors, and the racers who buy from them, have access to a number of Power One SKUs that are intended solely for track use.” This is not exclusive to Michelin, as major competitive tire brands take similar steps to funnel their tires to racers. The racing version of the Power One is also known as the “Racing 17 Treaded,” the number referring to the wheel size. The racing Power One receives further designation with either A, B, C or V tacked on, as in Power One B, while the street tire is referred to solely as Power One. There are 20 variations, or “models” as Michelin calls them, of the Power One when combining the eight sizes and nine different compounds available between the Power One and Power One treaded race tire, with the lion’s share of tires in the race category. The tire’s also available in limited numbers in slick and rain versions for those 16.5-inch wheels used almost exclusively in racing. The primary difference between the over-the-counter Power One and those issued through trackside distributors is construction. The rear race tires have stiffer four-ply construction. Depending on the various available compounds and carcass materials chosen, the front race tires may utilize four or five-plies. The race fronts also have a more triangular profile for quicker turn in. The street going Powers are made with three-ply construction, front and rear. Experience tells us the obvious conclusion to draw is that the race tires will likely provide greater feedback while leaned over and even more grip than the streetable tire, but probably at the cost of reduced bump compliance and/or straight-line stability. On the upside, the racy Power One should hold up quite a bit better than the road version might to all the heat developed by speeds and forces generated during racing, or racing speeds. Potentially quick wearing aside, we were impressed by the tire during some follow-up street time. Rolling into a turn, from upright to your lean angle of choice, the sensation is that of a smooth, linear action. Combine that trait with good feedback from the front tire, and the result is a predictable tire. Predictability leads to confidence and confidence can lead to quicker, smoother riding which is more enjoyable anytime, whether on the track or in the street. MSRP for the Power One we tested is $247.07 for the 120/70-17 front, and $356.21 for the 180/55-17 rear. One caveat: If you’ve not shopped tires in a while you should know that pricing varies widely from retailer to retailer, and they regularly can be found priced lower than the MSRPs. Michelin doesn’t set MSRPs for race products, leaving pricing up to its trackside vendors.